I'm been living in Germany now since August 2009 and I'm always interested in the lifestyle trends here - mostly interiors but also product packaging, food trends, cosmetics, fashion, beauty treatments... It's all so fascinating to me. Lately, I've been wondering what the next big food trend will be. Maybe porridge? With food, it was cake pops and cupcakes... Then pulled pork and frozen yogurt... Now it's all about the burger and food trucks. Honestly, most of the food trends are very boring to me because what happens in Germany with food today already happened a decade ago in North America - so it's the least inspiring trend to follow. I've long been a fan of so I'm happy to see beautiful food and ceramics combined in their latest styling though after reading their press release I realized this collection is more than what meets the eye. This is their GRØD collection. For those of you unfamiliar with , they have five in Denmark and everything for them revolves around the simple, typically Nordic, bowl of porridge. GRØD has spiced up this healthy and nutritious dish offering it in their restaurants in several tasty options on the menu. In addition to porridge, their menu also consists of simple but refined dishes made with local ingredients which has made GRØD one of the most important and trendy restaurants in Copenhagen. Broste and GRØD have teamed up to create a small collection of earthenware that is traditional, minimalist and very Nordic. When I see pieces like this, I just want to touch them and serve my own recipes out of them - they definitely have a sensual feeling to them and I just love the uneven edges of the bowls. Beautiful! I'm packing now and getting ready to take the morning train to Paris. I'm excited because it will give me 6 hours to relax, read and write in my journal. Maybe I'll do a little Instagramming too. Once in Paris, I'll celebrate my book launch in French of from 7-9pm, if you would like to attend. Then on Saturday and Sunday I will roam the streets with my camera, so follow me on Instagram to see Paris through my eyes for photos and IG Stories too. Next week, I'll be in Hamburg and then, the week after, in Milan for a week so you will have lots to see on my IG in the weeks to come. Let's talk about pre-teen and teen room decorating for a moment because so many girls are out there who love to decorate their rooms but aren't sure how to begin. I was once a teen obsessed with decorating my bedroom and today I meet lots of girls between 11-17 who ask me for tips and help with their rooms because they tag along with their mom to my book launch parties because they are curious. It's the cutest thing that I've observed over the past year - more teens coming to my launch parties because they're interested in decorating. No wonder Anthropologie is pulling back from the clothing space and moving more into the decorating world because the big trend in western society is definitely ALL ABOUT THE HOME right now. Fashion will always be important, but the home needs to look good too, right? Let's talk about teens and decorating. One thing I always tell young girls is to paint or wallpaper and go a little crazy if it fits their personality or to go glam or trendy if they prefer that route. Teenage girls love trends and glamour, they want to be grown up in one sense but totally girly in another. I believe it's one of those spaces where you can go bonkers because you are young and free. Do it. Plus, it's a blank canvas and you are the artist so experiment and play. In fact, your bedroom as a teenager is the best canvas because in that space, you can learn what you like from color and texture to overall style. Though it will evolve over the years, it's a great way to get started and to decorate. To inspire you a little, let's look at some patterned wallpaper from . They make HUNDREDS of creative, quirky and colorful patterns that I think work great in teenage sleep spaces and even dorm rooms. Here are my 10 picks, some even a mom may want to put out in the dining or living room space (like my favorite - the white faux brick). I wish we had these options for wallpaper when I was sweet 16. Go for it girls, you're only a teenager once! Hello everyone, it's and I'm here today to share my once-monthly column about tabletop styling and food. I'm German, yet our annual family summer vacations in Holland for the past thirty-seven years (I'm only 40!) shaped me and my sense of style. I love the the laid-back, relaxed and joyful lifestyle of the Dutch and whenever opportunity arises to visit Amsterdam I use it! For March, I've created an Amsterdam-inspired tabletop idea to inspire you for spring. I just returned from the city of canals and bridges with my dear friend Dunja last month and though spring seemed far away at that time we still enjoyed strolling through the streets and tiny alleys for hours. The beautiful canal houses are one of the most typical symbols of the city, so I started to search the web for a DIY everyone can implement without spending much money to their tabletop to bring in a little Dutch charm. I ended up finding a at . All you have to do is to print the templates and cut out the houses/ windows. Lucky for me, cutting out the small windows a little inaccurate gave my houses an even more charming look! Haha! Happy accidents are nice, aren't they? The perfectionists amongst you can also glue transparent paper behind the windows which looks wonderful when you are planning to illuminate them with candles in a jar. You can also use craft knife and self-healing mat. 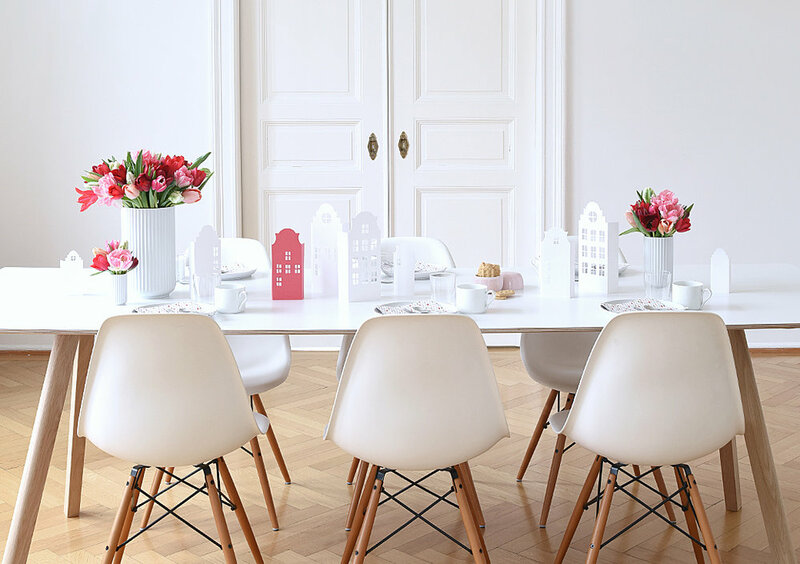 There is no Dutch-themed table decoration without tulips, agree? In our local flower shops we are experiencing tulip high season right now and one can draw from the full range. I picked different shaped tulips in rich shades of pink and red and placed them in my vases from . Furthermore a little treat in the form of Chocolate and Beet Brownies with a cream cheese topping and cute canal house biscuits for ornament went on the table for my afternoon coffee gathering. You will find the brownie recipe at . The pretty chocolate bars you see on one of my images are from , definitely one of the most popular locations for breakfast, lunch, coffee&cake and decoration shopping in Amsterdam currently! They also run an online shop in the meantime. Their chocolate, postcards and candles are the perfect souvenirs! The bars are the perfect hostess gift to your guests. Have a beautiful time welcoming spring... soak up sun, light and colors! I am looking forward to see you again with a new column posting in April everyone! Tot ziens & veel liefs! All I have been thinking about for the past several months now are kitchens and bathrooms! What is your current design obsession? I came across the Park Kitchen Nottingham by today, so very English I think, and I simply MUST how you some of the details because it's like one of those kitchens that you imagine having if you took a place in the country in addition to your city apartment. I decided to put together a little 8 step guide to creating a modern country kitchen like this one. 1. Lighting from a different era and style. I LOVE this. When I see a kitchen like this, I expect the typical overhead lighting that is generally used to complete the look - something country, for instance. This feels very modern, classy and definitely very early turn of the century. You'd imagine this in a sleek New York City penthouse in the 1930s for instance, not in an English country home. It's a great contrast. The understated oragami-like pendant above the sink is also very unexpected in a country kitchen but it's definitely working! It's modern and the form is just lovely. 2. Naked windows. If you don't worry about people looking in on you at night while washing dishes, keep the windows naked and fabric-free. If you must add a little something, opt for a barely there white shade that you can just roll down in the evening. Less is more, and if you want lots of light in your kitchen, naked windows are the way to go. I have white Plissé shades and will never go back to roman blinds or anything else in my kitchen. Plissé shades are amazing. 3. Retro minimalist touches. I love the retro touches - the radio on the countertop and the smeg - perfect. You don't need to go for an American diner look or cheese it up when it comes to retro hints. Keep them very spare but there. This smeg is honestly gorgeous in the space. 4. Hardware that doesn't look like a kitchen anymore. These handles look like something from your bedroom cupboard, right? They give this kitchen such a cozy and warm vibe, not clinical or typical kitchen with sleek this and sleek that. Warm brass hardware dresses the space up without making it glamourous. I also like these types of handles in a kitchen because of the way they age over time, brass is beautiful like that - such character. 5. Mix of work surfaces. I spot some hardwood on the island and marble on the countertops. This is a nice mix because if the island was also marble, the kitchen would look more sleek and modern. If the countertops had been all wood like the island, the gray cabinetry wouldn't have stood out as crisp and fresh. This mix works. Plus, on a center island, a wooden prep space in a family kitchen is so nice because you can really roll out cookie dough and get to work! 6. Simple open shelving. I like how this shelf isn't loaded with visual noise like product packaging and things to read. Instead, it's simple and clear - glassware, ceramics, a few sprigs of flowers, a wooden cutting board. Sure, you can drink from the glasses and use the cutting board, but it's more of a beautiful display area in my opinion. If you have enough storage below the countertops, who needs cabinetry on all of the walls in the kitchen? 7. Glass top dining table. In this room, I love the table the most not only because it looks vintage, but because it has a glass top which is not so common these days AND because I love how it reflects all of the natural light from the bright and sunny kitchen. Wood would have absorbed all of that light and the dining space wouldn't be nearly as vibrant. Such a great trick when you have a large room and you need to balance the light and the window sources aren't available to do it for you naturally - add glass and/or mirrored surfaces. What a gorgeous space! This is a little fantasy of mine now for many years - a country home with a lovely kitchen in perhaps this gray, shaker style. This kitchen is by deVOL and is absolutely stunning and indeed fits my happy country life fantasy very well. Hello dear readers and friends! The book and I wrote, , will soon have its official launch party in Paris! I am over the moon to announce this special event on March 24th from 7-9 pm where I will be making a special appearance in Paris at the beautiful shop of to celebrate published by . I am very excited because I've never been to France to meet fellow bloggers and friends of cattledogs there at an official party. I can't believe it, especially since I've been to Paris so many times in my life! This is why I decided to take this trip and go there to just see who shows up to say hello. I want to meet friends and fans and see some of my blogging peers, too. It's the same week of my birthday, so I've decided to make a special weekend out of it so I'm staying in a nice hotel and treating myself to a spa treatment there too. A book party, a nice hotel, walking around Paris with my camera in the Spring, it's not such a bad idea! In fact, if you have ANY inspiring suggestions on what I should do on March 25th for the day (or evening) or the morning of Sunday March 26th, please list them in the comments section below because I'll be roaming the city on the look out for inspiring things to do and see in addition to and e of course! By the way, if you missed our book trailer, here it is... This is for the English version, , but the content is the same as the French edition. See you March 24th, Paris!!!!! I've been collaborating with for years, in fact I remember when they were in beta and we spoke about their exciting new website in 2006. Here I am, 11 years later, and I'm still a fan of their site and what they do. But what exactly DO they do, you may wonder? Well, it's simple. If you don't have thousands to spend on a website but you want it to look expensive and gorgeous, you can shop Squarespace for everything from a domain name to a website template and even a logo for your site. It's easy to pull your entire website together in a day (maybe more if you are a perfectionist like I am). BUT you COULD DIY your own website in 6-8 hours. Today dear readers, I'm going to walk you through how to create a Squarespace website in 6 Easy Steps. Ready? 1. DOMAIN. Visit and if you don't already have a domain name, search for one to see if what you want is available. You can search at the top of the main page on the site. Need to learn more about domains? Then . If the domain you want is not available, they will suggest a list of alternatives. If you don't need a custom domain name and just want to use the preassigned name from Squarespace or you ALREADY have a domain name and want to use that, no problem because Squarespace now offers . Move to the next step. 2. TEMPLATE. From the main page click on the button far right that says GET STARTED which will bring you to the . There are many categories along the left sidebar for you to peruse. This step will be where you will spend the most time, because there are many to browse and I'm guessing you will have a few that you won't be able to decide on in the end. This is where you need to call in a friend OR just close your eyes and pick. Don't try too hard to have the perfect template right now, as Squarespace puts it, "Pick your template based on how close it is to your ideal website, but don't worry about an exact match. Your pages, content, fonts, colors, and more can be changed after you sign up." You may want to write that down so you know what you're looking for. Big photos, page, about page, portfolio, shop, or something else? List it and then look. 3. SIGN UP AND START CREATING. After you find the template (for instance I love the and this is one I want to work with for my new website) click on the button in the upper right hand corner when you are viewing the template that says, "Start With This Design". Then complete the short form and click on "Sign Up + Create Site". Next you will be asked some questions like, "What is your site for? ", "What is the website about? ", "What are your goals for this site? ", and then you are prompted to fill in the site title. 4. PERSONALIZE. Next, your "new" site will open and this is where you can personalize everything for your own custom website. Along the bottom of the site, you will see a black bar alerting you that you have a free 14 day trial. If you want to actually go beyond that and purchase a package, you can use code DECOR8 for 10% off your first purchase. Okay, so now it's time to get to work. This is the other step in this 6 step process that will take you the longest but if you are clear as to what you want and work quickly, it may be quite quick. I know what I want so I'm willing to guess this will be a fast step for me. Fast as in, 8 hours max. Trust me, to build and launch a website, that's lightening speed. 5. ADD LOGO + IMAGES. Upload or create , add your own to the "gallery" on your site, customize and tweak until you have exactly what you need and like. It's best to have a folder on your computer that you title "Squarespace" or something so you can drop ALL of the files you put on your Squarespace site in that folder first and then drag and drop. I really like to be organized when working on projects so I have folders for everything. 6. SPELLCHECK, EDIT, GO LIVE. With the design in place and ready to go, edit all of your text, check for spelling errors, and go through the site, page by page, to tweak as needed. Then go live and ask your friends what they think and even share the new site screenshot on your social sites like Instagram. If you do, use hashtag #squarespace so we can see your new site! SMILE, you did it! Next month, I'll post again to show you the part two with my shiny new website. Stay tuned! If you want to build your own website or shop, go for it, and use coupon ‘DECOR8’ for 10% off your first purchase. This is a sponsored post in partnership with Squarespace but all words and opinions are my own. Узнать как Ulefone Tiger купить в любом городе.